Copper ore is the only source of copper plates, which are one of the two principal raw materials (along with iron plates, made from iron ore) for crafting the vast majority of items in the game. In the early game, copper is needed in smaller quantities than iron, with some early-game products not requiring it at all. Demand for copper increases considerably in the mid- and late-game, where it (mostly in the form of copper cables) is required mainly for the assembly of electronic circuits and the myriad products those are required in. The size, density, and richness of copper patches can, as for all other resources, be adjusted upon map generation at the start of a new game. 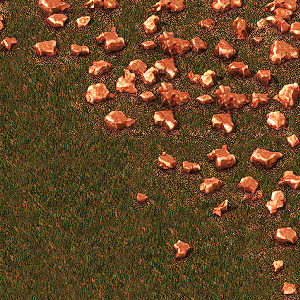 Like all resource patches, copper patches increase in richness with increasing distance from the starting area. This page was last edited on 18 December 2017, at 13:09.